Recently, US President Trump announced an aggressive new policy toward Iran, saying he will not re-certify the Joint Comprehensive Plan of Action (JCPOA) that was adopted on July 14, 2015 in Vienna, under which Tehran has pledged to limit its nuclear activities. Later Rex Tillerson announced that the US is trying to stay in the Iran nuclear deal. 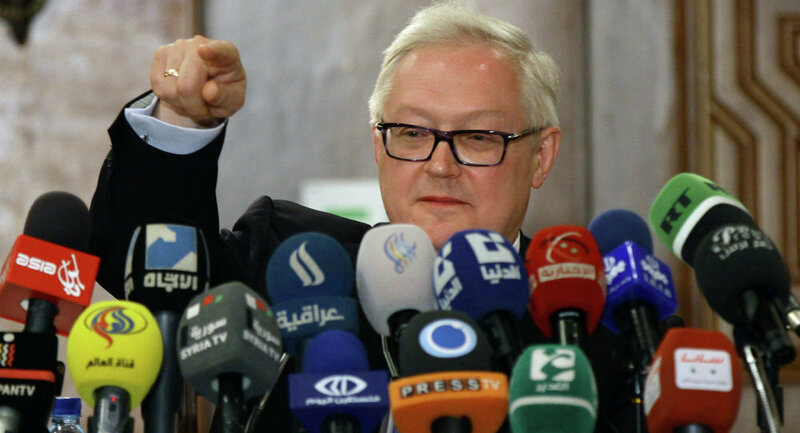 MOSCOW (Sputnik) – According to Russian Deputy Foreign Minister Sergei Ryabkov, Washington has not made any official “announcement of a US withdrawal from the deal, but the demands made by President Trump create questions about many things. That is why, it is time for consultations, analysis and the consideration of various options." — MFA Russia 🇷🇺 (@mfa_russia) 20 октября 2017 г.
Moscow is not sure that the United States "has decided on which topic and issues the commission should be convened. The situation now has significantly deteriorated. That is why before we resume the work of the mechanisms included in the JCPOA, we have to define the key issues. Among these issues is Washington's refusal to perform practical participation in the framework of the JCPOA," Rybakov said. #IAEA verification of Iran compliance with JCPOA is based on terms of agreement; not the ulterior motives of US officials, nor of lobbyists. — Javad Zarif (@JZarif) 2 сентября 2017 г. ​​Russia is absolutely sure that “Iran is conscientiously fulfilling all the requirements of the agreement that we have," Ryabkov said, adding it rules out any possibility of renewing UN sanctions against Tehran. Besides, Moscow is not ready to participate in any negotiations concerning "enhancement" of the Iran nuclear deal as all urgent issues have been settled. However, Ryabkov noted that "now is the time for consultations, analysis, and consideration of various options”, as US President Donald Trump's statements on withdrawal from the JCPOA put many things under question, though Washington has not made any official announcement yet. Donald Trump previously stated that the White House will work with Congress on the "serious flaws" of the July 14, 2015, Joint Comprehensive Plan of Action. The US President refused to officially confirm to Congress that Iran is in compliance with the agreement. At the same time, Trump noted that if the US efforts to "improve" the agreement fails, then the US will withdraw from the JCPOA. — Javad Zarif (@JZarif) 17 октября 2017 г. Addressing the issue of the terror group Daesh (ISIS), the deputy foreign minister said that Moscow welcomes "any progress in the fight against Daesh and in this regard the achievements in Raqqa are, for sure, a step forward. We believe that in order to reduce negative consequences, comprehensive and close interaction in counter-terrorism efforts is essential." On Friday, it was announced that Raqqa was completely liberated from Daesh terrorists, with the support of a predominantly Kurdish coalition led by the United States. Raqqa has been under the control of the Daesh since 2013, the city was considered the unofficial capital of the terrorists. In 2016, a coalition led by the United States announced the launch of an operation to liberate the city.